I was flabbergasted when I saw these two photographs. The first shows this long-haired tabby cat unresponsive and frozen inside snow. To all intents and purposes Fluffy looks dead. It’s hard to come to any other conclusion. 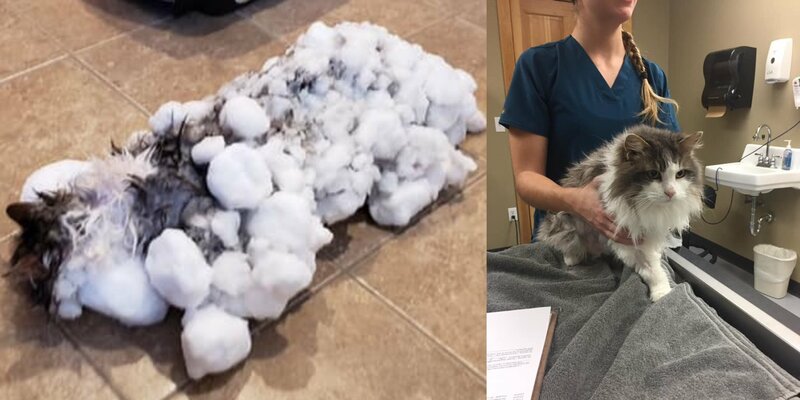 She was buried in the snow outside her home in Montana when temperatures hit a 9°F low. That was during the polar vortex, a much discussed weather phenomena which recently hit parts of the northern states of America. Extraordinarily, veterinarians thawed her out with hairdryers, warm towels and fluids. Within an hour she was responsive and doing great. She continues to do well, the veterinarians say. The photographs, incidentally, come from the Animal Clinic of Kalispell. Well done and thank you. It’s believed that Fluffy was unable to get home during the cold snap due to injury but it is unclear what the injury might have been. I’m just amazed by the recovery powers of the domestic cat. They have an enormous durability and when you consider that their wild cat ancestor is a desert loving small wildcat it’s amazing that they tolerate cold so well. We don’t now how long she was frozen and ostensibly dead. She must have been alive but in a state akin to hibernation due to the extreme cold. This entry was posted in cats in emergencies and tagged cats in emergencies, cold weather by Michael Broad. Bookmark the permalink. And this is another why humans must NOT let their kids outside!!! Bloody morons! !